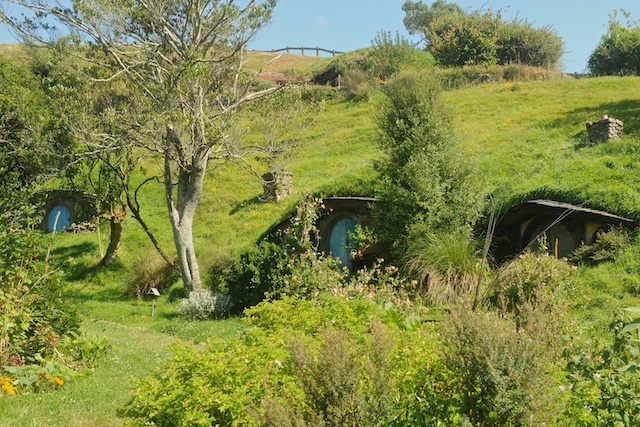 Mary Jane chose to visit the Hobbiton Movie Set near Matamata, New Zealand where she stepped back in time to JRR Tolkien’s Middle Earth. Before I left to take the cruise, I re-watched the three Lord of the Rings movies to refresh my memories. 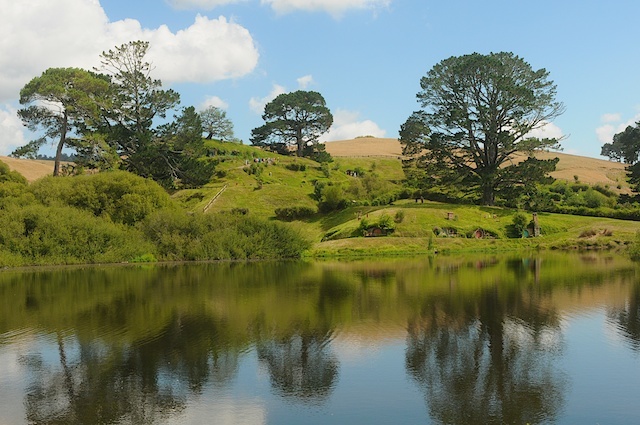 Our bus crossed the Kaimai Mountains and headed across the Waitkato lowland to the Hobbiton movie set, built in 1999 for the Lord of the Rings trilogy. 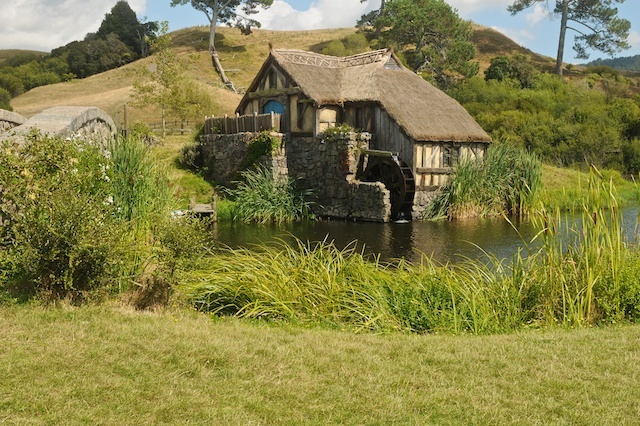 In 2010 the set was completely rebuilt in amazing detail for the three new Hobbit movies. 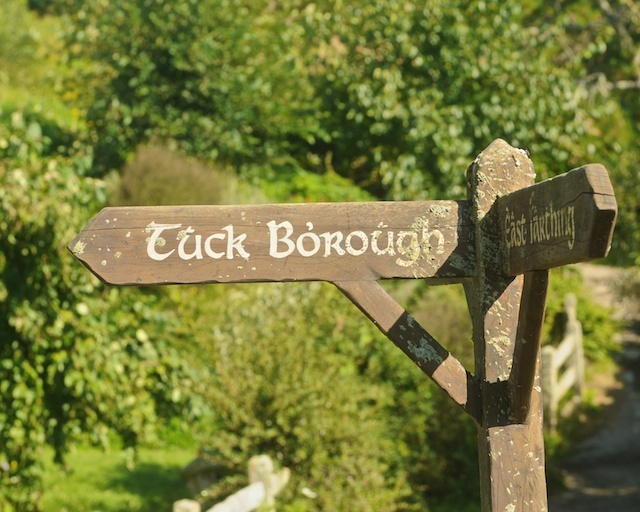 We enjoyed walking around the home of the hobbits, including Bag End where Bilbo and Frodo Baggins lived. We saw the Party Tree, the restored bridge and the old pub. Just what is a Hobbit? According to a book (The Hobbit: An Unexpected Journey: The World of Hobbits) I bought at The Shire Store, a hobbit, some times called a Halfling, is not a dwarf, which is broader and stronger than a hobbit. Nor is it an elf, even though both elves and hobbits have pointed ears. 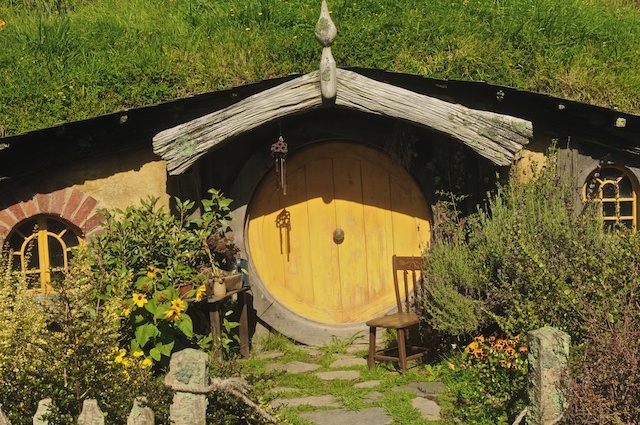 Hobbits are rather short, averaging about 3 feet tall, and they live for a very long time. Some reach ages well over 100. Perhaps their most distinguishing feature is their feet. Hobbits never wear shoes. And their feet are very large when compared to a Hobbit’s overall height. The skin on their feet is extremely tough, especially on the bottom, so they can walk anywhere. Moreover, a Hobbit’s feet are covered with thick curly hair. 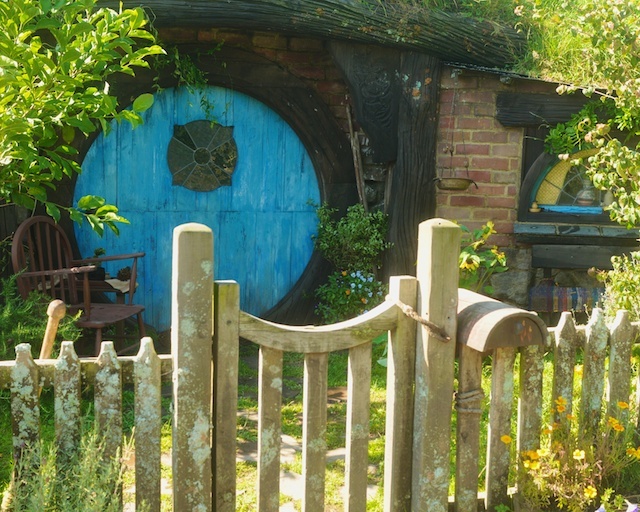 You are more likely to see a hobbit wearing an apron for cooking than armor for fighting because they like everyday down-to-earth adventures, like finding an extra cake in the pantry best. 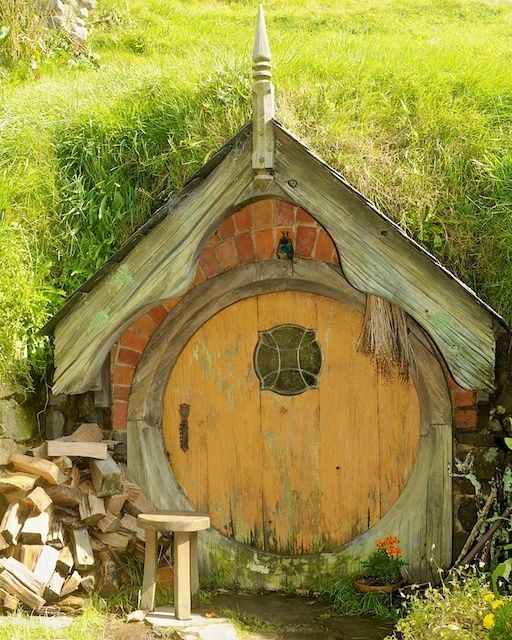 Hobbits do not live in houses, but in holes in the ground: hobbit holes, which are very comfortable, cozy places and come in many different shapes and sizes. 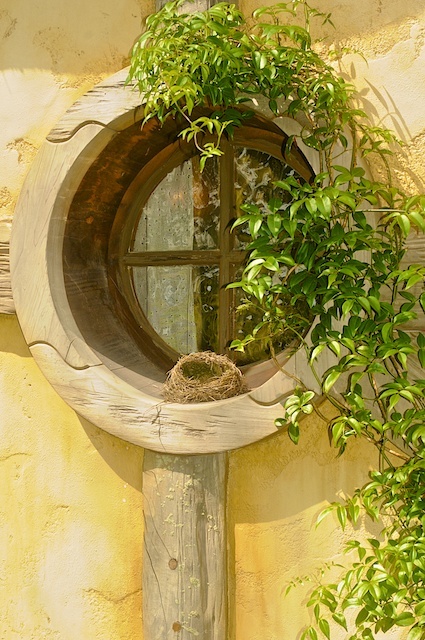 Hobbits like to use circles when they build their houses. The windows are all round, their gardens have many flowers and all sorts of vegetables. To a hobbit, food is the most important thing in the world and mealtimes are to be shared, especially with good friends. Hobbits prefer doing jobs that help them live a quiet, normal and peaceful life. They are farmers, gardeners, blacksmiths, and cooks. 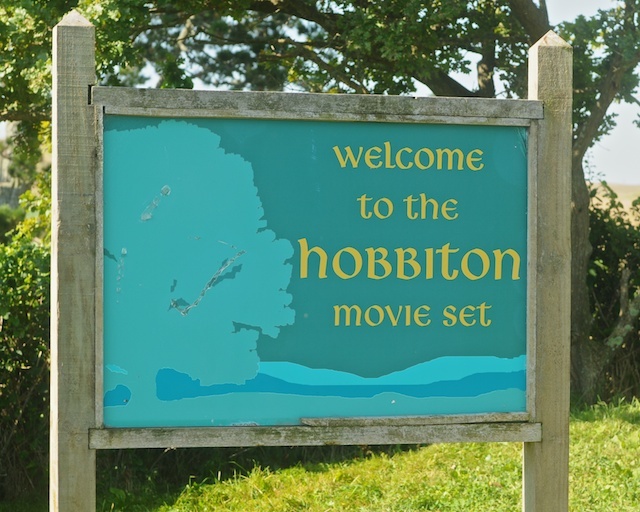 If you are looking for excitement, then the hobbit life is not for you. 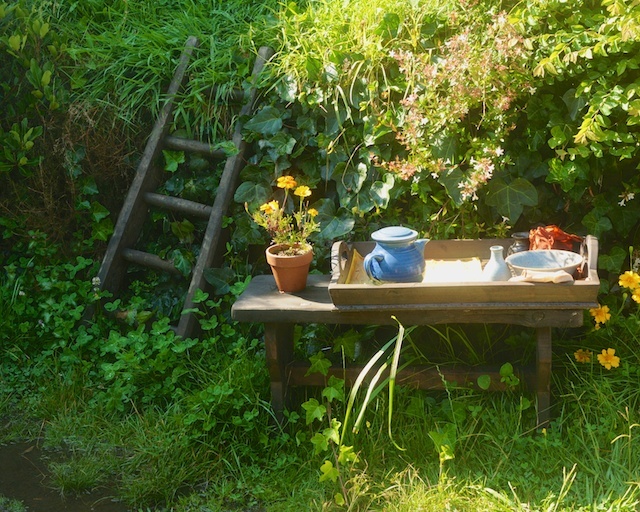 A hobbit would rather sit on his porch and watch the cows munch grass or chat about the weather. 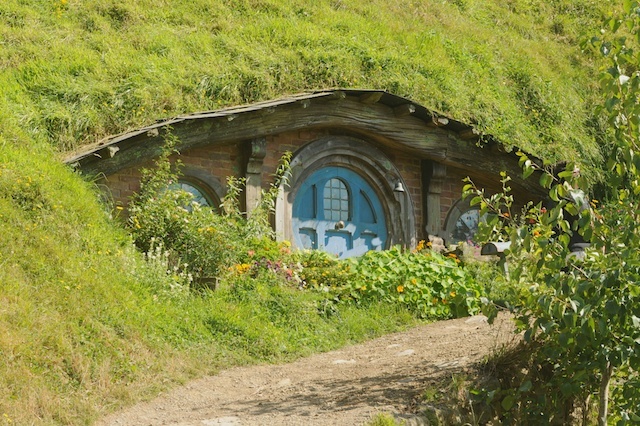 The new Hobbit movie (The Hobbit: The Unexpected Journey) is set during a time prior to the Lord of the Rings Trilogy. In this latest movie we see Bilbo Baggins as a young man and his adventures with Wizard Gandalf the Grey. 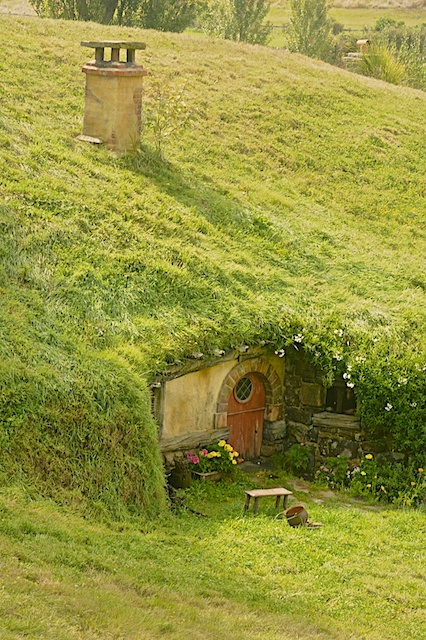 The picture below shows the house that Bilbo Baggins lived in called Bag End. 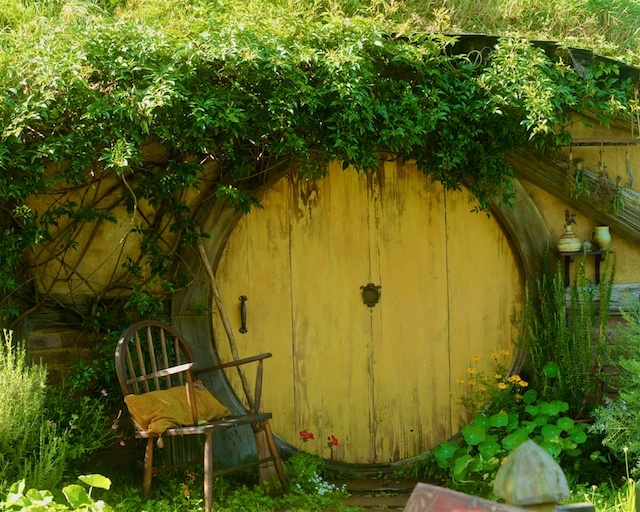 It is dug into the side of the hill, just north of Hobbiton, at the end of Bagshot Row. 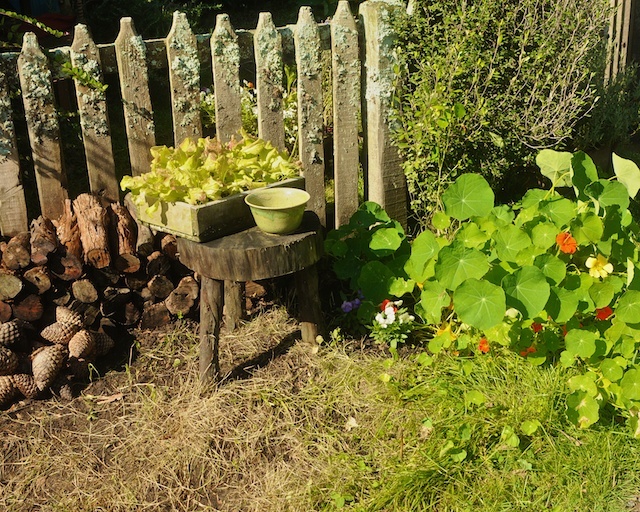 There were many pretty flowers as well as a large garden for growing all sorts of tasty vegetables. 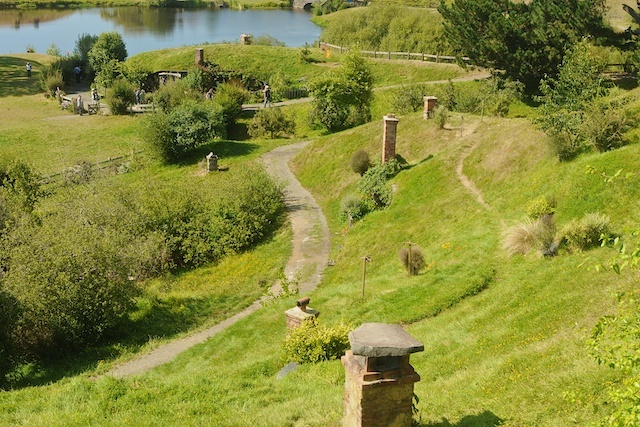 We ended our tour of Hobbiton by walking down the hill alongside the Old Mill. We stopped at the Pub for a drink of Ginger Beer before leaving the Shire and to return to our ship.